Reflecting on the nature of longitudinal waves, it occurred to me that a flat spiral secondary coil produces most of its power in the outer windings of the coil. 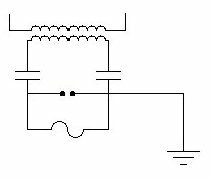 This prevents a peak of high potential on the terminal capacitance. 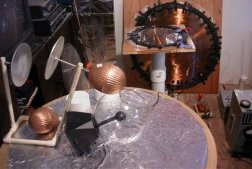 Using the schematic below with a 13" single wound coil, 3.5 turns of RG59 coax as the primary, two .054µF capacitors, a magnetically quenched static spark gap, and 15KV 60mA NST, I setup a flat spiral Tesla coil. Here are the parts used in this experiment. In the background and on the pedestal in the image below is the single wound coil as I started with. In the foreground is a 30" aluminum disk encased in acrylic resin. There is an insulated wire leading out from the bottom of the aluminum disk. This disk is electrostatically sealed to prevent electrons from leaking out. The purpose of this disk is to act like a jug full of air, except that it will fill up with an alternating density of electrons. 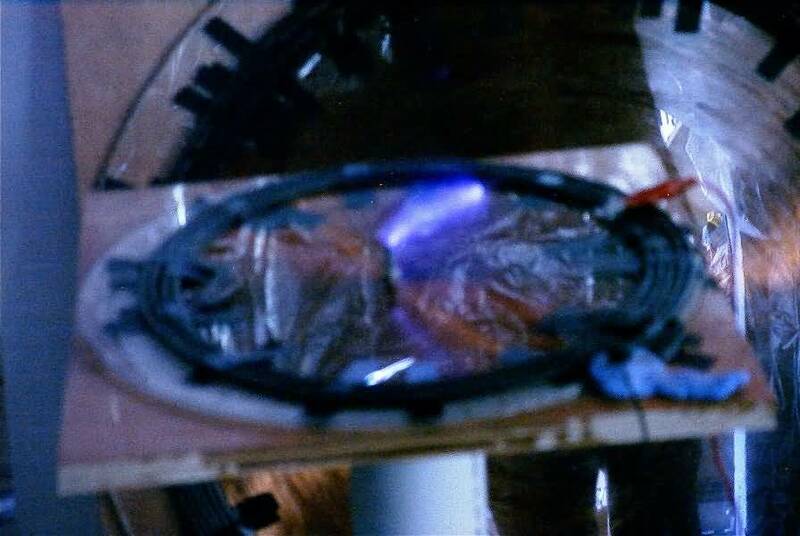 The plasma ball on the disk is sometimes used with it's own power on, sometimes used with the single wound coil power through it, and sometimes with both, as will be indicated. 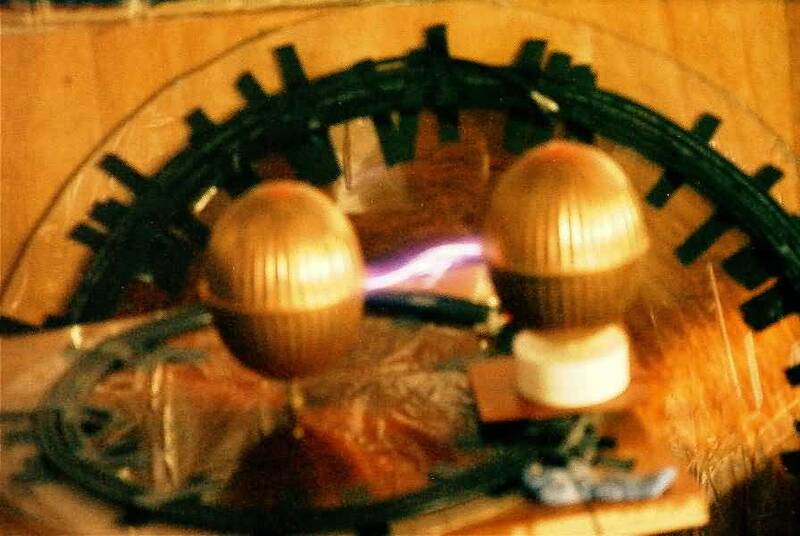 I used my handy flat plate capacitor stand to hold the copper ball in some experiments. A couple years ago, when experimenting with plasma balls, I noticed they appeared to produce longitudinal waves out the side of the glass. I supposed the waves were longitudinal due to their nature in lighting fluorescent tubes. 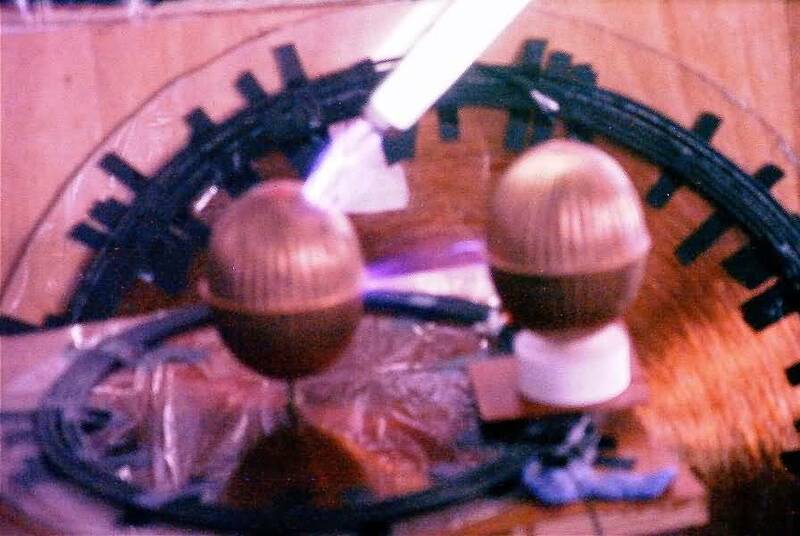 The tubes, when lit by the plasma ball, showed signs of pulses or standing waves in the light pattern. Also, the voltage coming out of the fluorescent tube was obviously potent and of high frequency, but I could not get it to induce into a stepdown transformer. So when I started this experiment I thought perhaps the plasma ball will help me to identify longitudinal waves. Now these experiments are just for exploration of concepts and ideas. As I discover real effects that warrant further study, then I will propose more scientific experiments aimed at getting answers. As can be seen below, when the tube is placed from the center of the coil along any radius, the tube is fully illuminated from the inside of the coil outward. This suggests that longitudinal waves are developed in the fluorescent tube. In the first photo the longitudinal waves were produced in opposite directions, causing the center of the tube to dim where the longitudinal waves neutralized each other. In the second photo, it is clear that the tube will fully illuminate from the center of the coil outward as all the longitudinal waves are in the same direction. The spark in the photo above is about 3.5" long. It appeared to be producing discharges mostly in the ultraviolet range. If the wire were held back further a purple glow would develop and there would be lots of hissing. A corona in the form of a cone would emanate from both the wire and the terminal post. 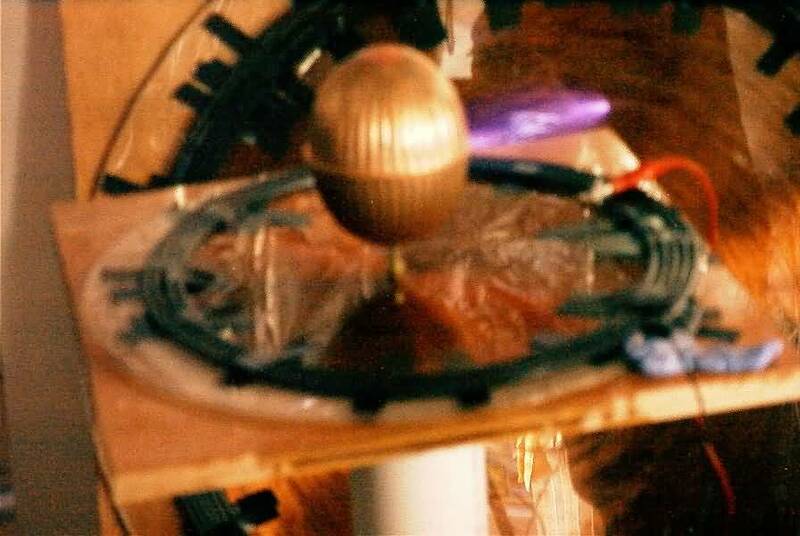 Connecting a copper ball to the terminal does not increase the spark length. But it does cause sharper sparks and a broader pattern of discharge from the outer lead. 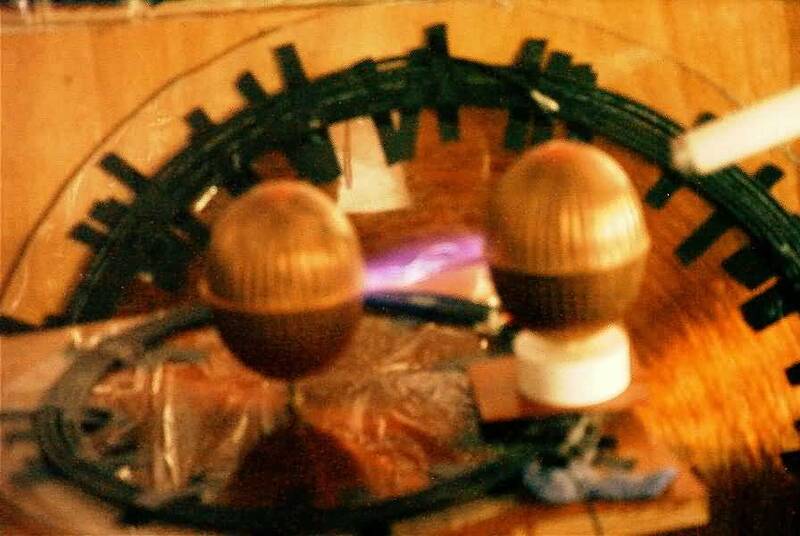 Adding a copper ball to the outer lead really defines the arc between the inner and outer leads. This coil lends itself well to bipolar operation. The ball on the outer lead is the ball I would expect longitudinal waves to emit from, the ball on the terminal is the ball I would expect strong electrostatic charges to emit from. This warrants further measurements. 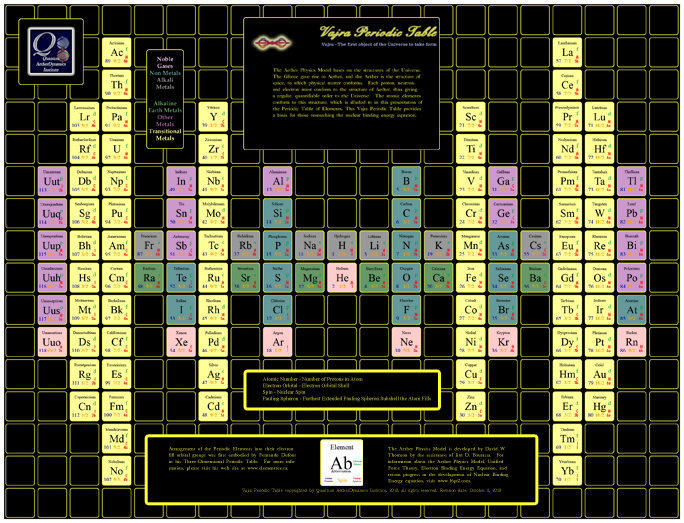 I will need to hook up an oscilloscope to these balls and attempt to get a waveform for each. 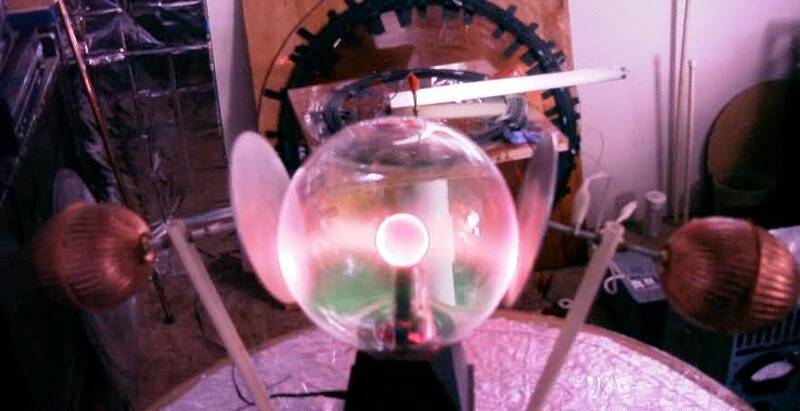 The plasma ball exhibits and conclusion are on page 2. This double cone bipolar coil was made by Nikola Tesla, confiscated by FBI after his death, and purchased from an estate auction through eBay. Click on the photo for more details. 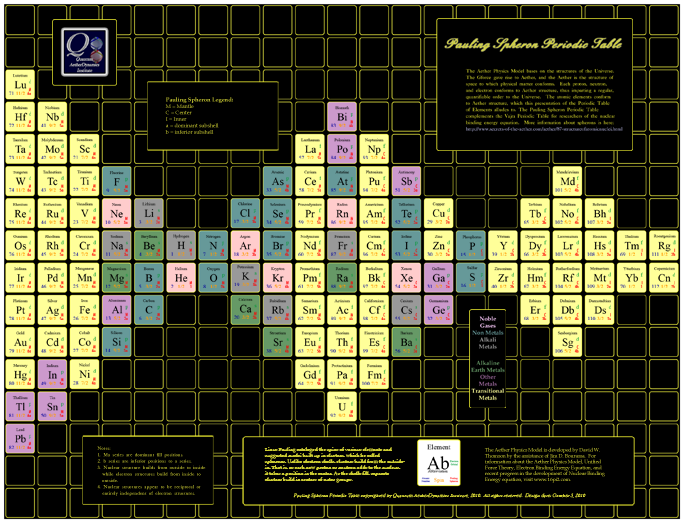 Order our unique periodic table posters from Zazzle. Click on the images. Also available are mouse pads, belt buckles, mugs, and t-shirts.